A lovely way to use my little pieces of leftover fabric. I was a little disappointed with this design. I had to send itto a friend to rework it, the second line of tack down didn't even have a zig zag stitch and the finish stitch was too narrow. You should really rework it. What a gorgeous applique Christmas tree design! 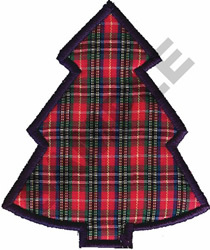 Use this to embellishment a stocking or tree skirt. Great Notions is happy to present CHRISTMAS TREE APPLIQUE machine embroidery design which has 2232 stitches and is [83.60 mm x 99.20 mm] large. If you would like to view more embroidery patterns please search on our embroidery designs page.